China’s supercomputer accomplishment is far more significant than one computer coming in first. Other countries have done it in the past with what’s called “stunt” machines ― fast and powerful, but unable to apply it to anything. 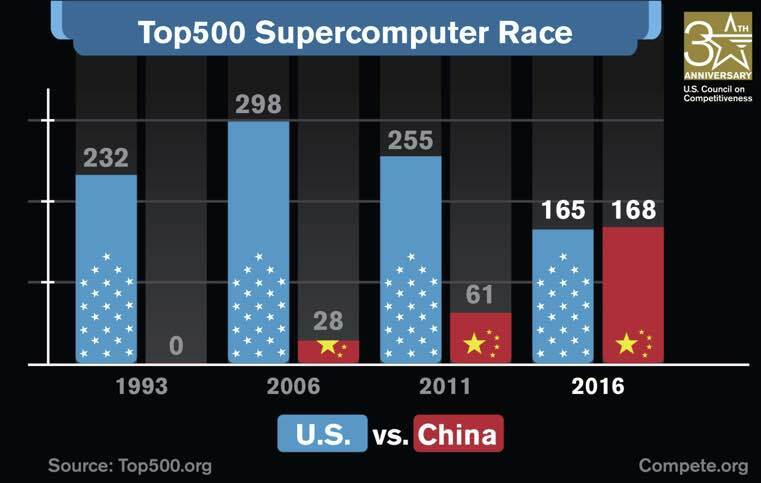 The stunning news here is that China created a High Performance Computing (HPC) “ecosystem” in an amazingly short period of time. Another important part of the Sunway TaihuLight announcement is that for the first time, the Chinese – built a 100 percent indigenous supercomputer. In an ironic twist, our scientists are trying to learn the recipe of the secret-sauce to the Chinese processor. China’s ecosystem also created the hardware and the middleware required to operate the computer. Maintaining leadership in high performance computing is a national and economic security imperative. As history has shown, HPC translates into innovations in aircraft, automobiles, oil and gas, biomedical, nuclear energy and military systems.